For Halloween 2018, Joe Jonas and Sophie Turner dressed up twice. Once as the pair from the Addams family (click here for the Addams Family costume idea) and another as Sansa Stark and an Elephant. Yes, Joe Jonas dressed up as Sansa from Game of Thrones, but people were quick to note that he looked more like Princess Fiona in Shrek. When you look closely I guess you can see the resemblance. But it’s a good effort for him to look like Sansa. He pulled it off and was quite funny. haha Sophie Turner dressed up as a cute elephant. Find Joe Jonas and Sophie Turner costume ideas below. Show that the chill of northern winds and the heat of your noble heart combines in stark perfection when you wear this exclusive Wolf Princess Costume created in our own house by our team of dire designers. This lovely stretch velvet dress has widely flaring arms and drops full-length to your ankles with a naturally shimmering look. Silver embroidered applique highlights the neckline of the gown, revealing your noble stature. What would a northern princess be if not for a short fur cape of brown and black to resemble the wolf within? 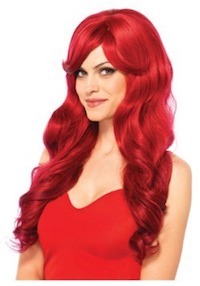 This is a red wig to look like Sansa Stark. She has red hair in the Game of Thrones. 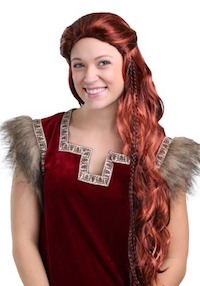 Click here to get Sansa Stark’s Red Hair Wig. 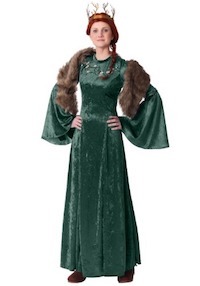 If you dude dresses in a long flowing gown and throws on a red wig, I’m sure they can proclaim they are Sansa Stark. Any way you put it, it’s going to be funny. You will be the riot of the party. We can’t blame the shoppers for being tickled pink by your gray velour jumpsuit and tufted tail. But it is the hood, with its majestic stuffed trunk, tusks, and ears that is drawing the most attention. When you do a little dance in front of your pal’s booth, her sales double! That’s some powerful elephant magic. So why not parade this playful costume around for an encore performance come Halloween and see what kind of crowd you can please, there? We bet it’ll be an unforgettable night! 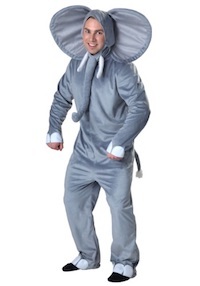 Click here to get the Sophie Turner Costume as Elephant. The flapping ears stick out far to the sides of the hood, and the long, plush trunk and tusks can be waved around while your little one lumbers about. Since elephants are social creatures, they will have even more fun playing with their pals dressed as elephants, or any other wild animals that they to hang out with around the oasis! 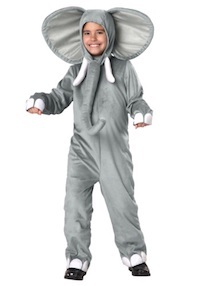 Click here to get Sophie Turner Costume as an Elephant for Kids.